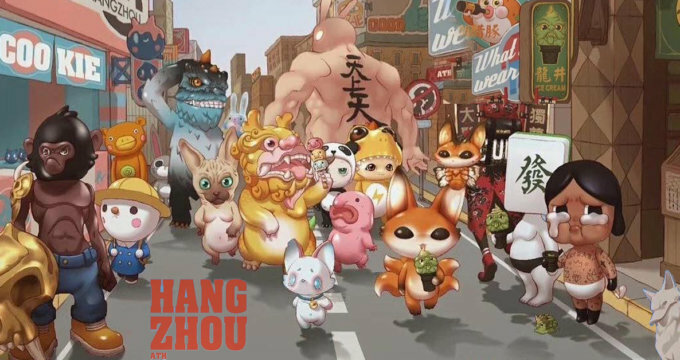 Remjie Malham lands in Hangzhou for the first ever Art Toy Hangzhou! Ready to add some Euro flair, Remjie has taken her new platform’s ToraTora and Doro as well as RedHotStyle Hairless Cat and Blobfish which are all limited and hand painted with Remjie’s signature colours and patterns. Our TTC Artist Spotlight Artist, Remjie Malham is ready for Hangzhou but are you and your wallets ready to cry? Get your best face on and clear your shelf space as Remjie will be at ATH so you can meet Remjie! Check out our TTC Artist Spotlight on Remjie HERE. Places you can find Remjie on Tumblr, Facebook, Instagram and Twitter. Dora sofubi figure unboxing below!